As we use our hands constantly to communicate, create and nurture, it is easy to forget that the hands are on display all the time. We are generally not aware how much the hands can give away our age. In fact, if your hands look much older than your face, it can be a giveaway that you may have had facial cosmetic surgery because some aspects of your appearance are mismatched. Many patients who have decided to undergo facial cosmetic procedures also opt to have their hands rejuvenate at the same time for a holistic, natural result. Exposure to the sun, hormonal changes and aging can cause uneven pigmentation, unsightly brown spots and skin cancers. During menopause, hormone levels drop and contribute further to dry and thin skin. For all of these reasons, your hands deserve as much attention as your face. For people who feel that the appearance of their hands could use some improvement, there are now treatments that can help. During the aging process, our skin gets thinner. This is especially noticeable when it comes to our hands. Veins and ligaments may become very noticeable and can even create the skeletal look sometimes seen in people’s hands. A gentle TCA chemical peel or IPL (Intense Pulsed Light) Laser treatments can help reduce and even eliminate brown spots and the TCA peel will improve the texture of the skin and reduce wrinkles. In order to give your hands, the treatment they deserve, our dermatologist will most likely use dermal fillers in combination with laser resurfacing. These help restore your skin’s volume while we concurrently remove age-related blemishes. In order to give the hands proper, natural-looking volume, our skilled Beverly Hills practitioners may use one or several dermal fillers, including Juvéderm, Radiesse or Perlane. These are injected under the skin into the collagen layer to mimic the natural collagen of the body. Our practitioners have been in the cosmetic industry for decades, and they completely understand the anatomy of the hands. This allows them to apply dermal fillers in a way that looks smooth, natural and beautiful. If your hands have developed age spots or other superficial blemishes, your practitioner may use Fractional laser resurfacing to remove the damaged cells. After firmly establishing the treatment area, your hand will be thoroughly cleansed. The laser is then applied evenly and expertly. This removes the outermost layer of skin on the hands, leaving only the healthy cells underneath. These can then regenerate a new layer of skin, reducing the signs of fine lines, wrinkles, age spots and other age-related blemishes. Hailed as the number 1 anti-aging breakthrough in recent years, fractional laser resurfacing with the Fractional CO2 laser represents the very best in laser skin resurfacing. It delivers powerful results without the harsh side effects that typically come with laser resurfacing procedures. Because of this, patients experience less downtime, less discomfort, and more rapid results. This is a simple, painless procedure with minimum downtime. Will be customizes procedure selected for you by your dermatologist. Every individual rightfully aspires to look good in a youthful and natural way. At Allure MedSpa, we assimilate impeccable artistic vision and best technological breakthroughs in dermatology to enhance the natural exquisite beauty of your skin. 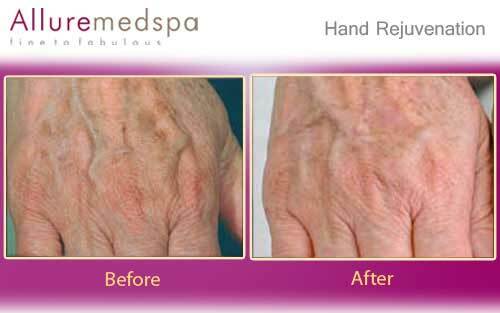 With its outstanding team of Dermatologists, Allure MedSpa helps you neutralize frown lines, wrinkles, fine lines and scars and rejuvenate your hands in its state-of-the-art facilities at highly affordable, value for money prices. No wonder, patients from all over the world throng Allure MedSpa to achieve their cosmetic and skincare goals. 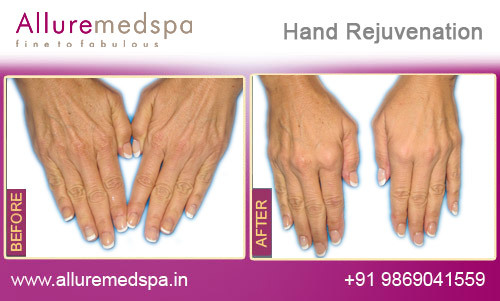 At Allure MedSpa, we approach hand rejuvenation on a case-by-case basis, giving your hands the individual, customised care they deserve. We know that no two pairs of hands are alike. Because of this, our first step is getting to know your hands through a consultation and examination. During this time, we’ll establish exactly what needs to be corrected and create a personal rejuvenation program for your hands. No anaesthesia is required for most these treatments. Fillers are formulated with a local anaesthetic. Pain is minimal with these treatments. The laser treatments feel like a warm rubber band snap. The area treated may feel warm for a few hours afterwards. Procedures are quick, minimally invasive and require no downtime. Every procedure requires different post treatment care instructions. Most people report very little or no discomfort after treatments. You can resume your daily routine 24 hours after your procedure. There is minimal aftercare. You will get the best results when combining these treatments with sunscreen and daily topical at home. The length of the procedure may vary, depending on which treatments. Laser and dermal fillers will take less than 30 minutes to complete. These are mostly one sitting treatments. Results will last for a considerably long time if proper care regime is followed. Allure MedSpa which is renowned for its state-of-the-art internationally acclaimed services, offers affordable and cost effective weight-loss and cosmetic contouring procedures. To know more about the cost of your procedure request a consult by filling the form below. Your consultation is your chance to ask questions about Hand Rejuvenation treatments and put your mind at rest. Our surgeons and cosmetologists will be there to offer full explanations and answers to all of your queries. 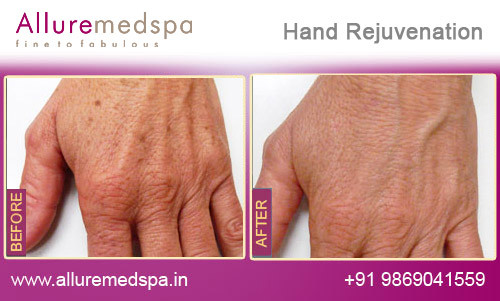 Anyone seeking to improve the quality of aging skin on the hands is a candidate for hand rejuvenation. If you would like to have younger, tighter, smoother, more even toned hands you should consider these treatment options and which ones are right for you. Reasons may vary from person to person. The most common reason is boosting self-confidence. No prior preparation as such is required. If required, your dermatologist will guide prior to the treatment day. 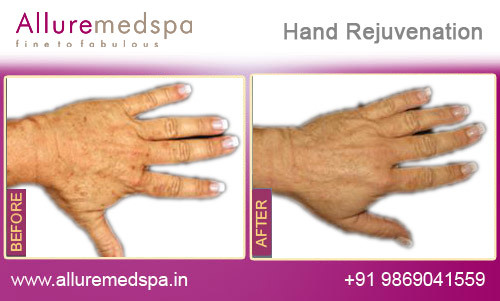 What is the Recovery Time of Hand Rejuvenation? 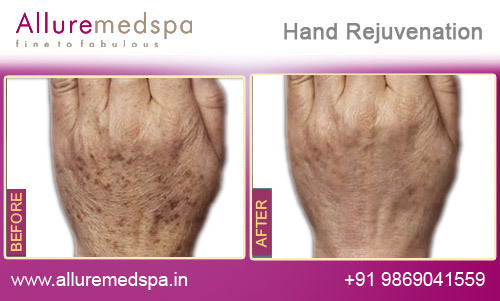 Recovery after hand rejuvenation depends on how much work was done to achieve the more youthful appearance. Basically, healing could take from one day to several weeks. During this time, over-the-counter drugs may be used to help with any pain, and cold packs are helpful. Doctors generally treat one hand at a time, which may be covered in a bandage for twenty-four hours. The hands should be protected from the sun after hand rejuvenation so a strong sunscreen should be applied daily. Do I need Anesthesia for Hand Rejuvenation? 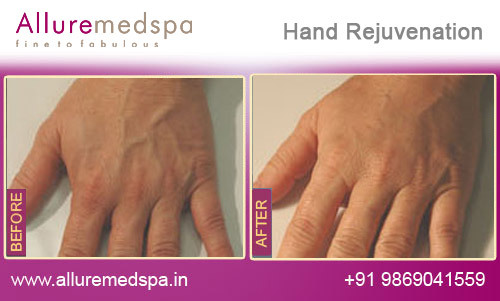 Anesthesia during hand rejuvenation also depends on the procedures being done. Some processes are better done under general anesthesia, but the majority of hand rejuvenation treatments may be done using only a topical or local anesthetic. This is an issue that should be discussed with the doctor prior to a procedure. All of the procedures used in hand rejuvenation are safe and highly tested. Allergic reactions, scarring, and infection, which are common in other types of surgeries, are unlikely; however, they are possible. Do I need to Prepare for Hand Rejuvenation? Depending on the type of procedures being done and the chosen anesthetic, patients may be given a sedative to take before coming for hand rejuvenation surgery. The doctor may also ask them to prepare for the procedure by stopping medications that thin the blood for a week or so before surgery.